For its second show of the season, Players Club of Swarthmore presents The Outgoing Tide, a deeply moving drama shot through with surprising humor. Written by Philadelphia playwright Bruce Graham and directed by George Mulford, tickets are available online at http://www.pcstheater.org. For group rates, contactgroupsales@pcstheater.org. 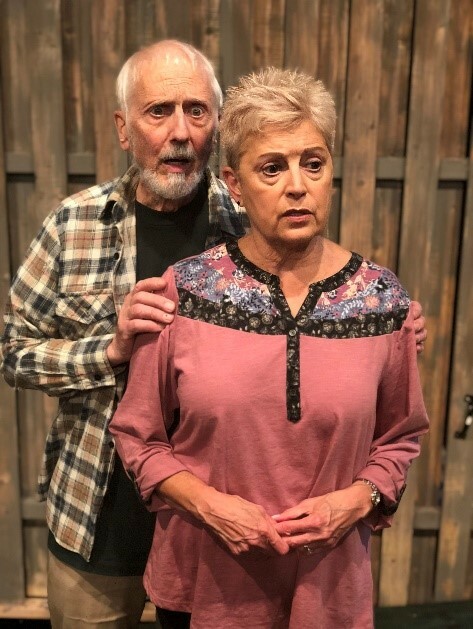 Gunner (George Mulford, Swarthmore) is a tough old guy, folksy and funny, the kind of memorable character we’ve come to expect from playwright Bruce Graham. Now life has thrown Gunner a curve. As he and his family, Peg (Marianne Green, Sellersville) and Jack (Eric Crist, West Grove), struggle to cope with his failing health, scenes from their past alternate with mounting drama of the present. Bruce Graham is a Philadelphia celebrity. A Ridley native, he has acted at The Players Club of Swarthmore in The Elephant Man and Arsenic and Old Lace. Graham’s plays include Burkie, Early One Evening at the Rainbow Bar and Grille, Moon Over the Brewery, Minor Demons, Belmont Avenue Social Club, According to Goldman, Desperate Affection, Stella and Lou, Coyote on a Fence, The Champagne Charlie Stakes, Funny Man, The Craftsman, North of the Boulevard, and most recently, Sanctions. Graham has won consecutive Barrymore Awards for Best New Play (Something Intangible, Any Given Monday), the Joseph Jefferson Award for The Outgoing Tide, and a Jeff nomination for White Guy on the Bus. White Guy on the Bus is currently nominated for the “Offie” – London’s version of the Obie Award. Movies: Dunston Checks In, Anastasia, Hunt for the Unicorn Killer. Television: Roseanne, Legwork, Cedar Cove, The Most Wonderful Time of the Year, Trading Christmas, and The Good Witch. Along with Michele Volansky, Graham is the author of “The Collaborative Playwright”. Graham is a graduate of Indiana University of Pennsylvania and teaches playwriting and film courses at Drexel University. He divides his time between Elkton, Maryland and South Philadelphia. The Outgoing Tide runs from Friday, Oct. 19, through Saturday, Nov. 3. Thursday performances are at 7:30pm, Friday and Saturday performances are at 8pm. Sunday performances are at 2pm. Graham will join the PCS artists in a talk back discussion following the Oct. 28 performance. Buy tickets online at http://www.pcstheater.org, by calling OvationTix at 866-8114111, or at the door. For more information about The Players Club of Swarthmore, including upcoming events, shows, ticketing and directions, visit http://www.pcstheater.org. Previous Movie Review: “The Oath” is a dark salve for familial politics this holiday season.